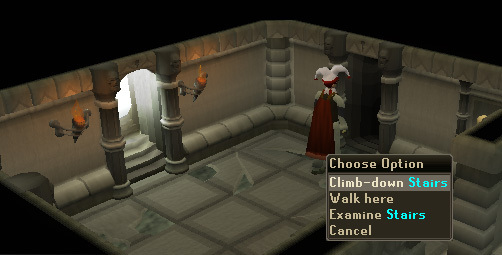 The Lumbridge Catacombs is a free-to-play area dungeon introduced with the Blood Pact quest. Therefore, in order to fully access it you need to have completed this quest first. It is a great place for very low combat training because the monsters' levels only vary from 1 through 20. 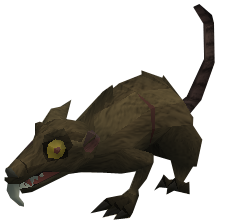 It is also a great place to train any type of combat for new players because many of the creatures here drop low leveled staples for all free-to-play combat skills. 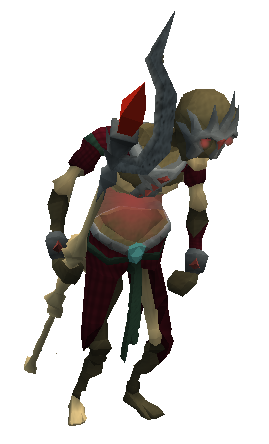 The Catacombs are located directly underneath the Lumbridge cemetery. To reach the cemetery easily, you can use the Home Teleport Magic spell on the normal spell book and teleport straight to the center of the Lumbridge Castle Courtyard, and from there you can walk a little east. 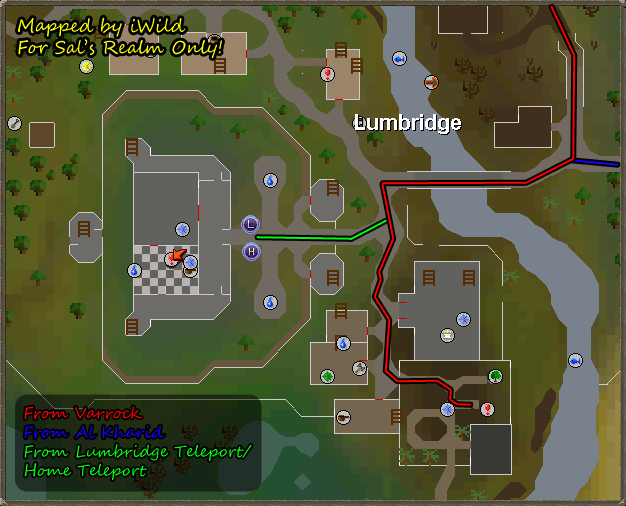 Alternatively you can use the Lumbridge Teleport spell (requiring 31 Magic, as well as 1 Law Rune, 1 Earth Rune, and 3 Air Runes) and make your way to it from there. 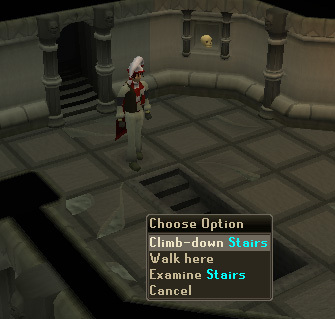 Once you arrive inside, you can take the staircase directly to the end of the dungeon. The staircase is directly next to you when you enter. Once you take the second staircase down, which will be right next to you as you exit the first set of stairs, you'll be right at the mouth of the dungeon its self. Entrance of the Catacomb sector. If you follow the small hallway you'll be in a miniature room with level 1 Warped Cockroaches. Well sized room containing quite a few level 3 Corpse Spiders. Room containing the Jade Statuette. 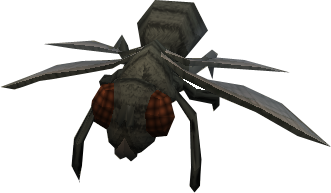 Also contains level 5 Warped Flies. Small room with level 7 Crawling Corpse Torsos. Another room with level 9 Warped Rats. The room containing the Topaz Statuette, also has level 11 Skeletons. A large room with level 12 Warped Bats. The room with the Sapphire Statuette. Also contains level 13 Corpse Archers. The room with the Emerald Statuette. Also includes level 14 Skoblins. The room with the Ruby Statuette. Also has level 15 Corpse Mages. The dead-end of the dungeon. A level 20 Dragith Nurn can be summoned by trying to take the Diamond Statuette. He must be fought in order to claim it. The dungeon itself is made up of a sequence of rooms connected by short corridors. As you progress, the monsters in the rooms get stronger; the weakest being the level 1 Warped Cockroach and the strongest being the level 20 Dragith Nurn. In every few rooms, you will find a statuette. There are a total of six statuettes scattered throughout the dungeon. These can be collected and then traded with Xenia, who is just outside the entrance of the catacombs, for a pile of money. However, upon taking the statuette a nearby monster becomes agitated with you and will attack you when you take it. From there you can either run away or kill the other monster. Note: You must kill Dragith Nurn to be able to collect the Diamond Demon Statuette. 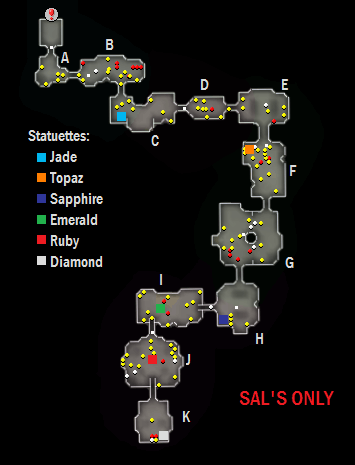 Refer to the map of the dungeon above for specific locations of the Statuettes. Note: Dragith Nurn can be evoked as many times as you want, even after collecting the statuette. If you have collected all the Statuettes, that brings you with a grand total of 2,500 gp. You can only collect these statuettes once, so they won't respawn after you give them to Xenia. 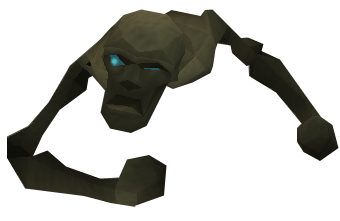 The Mask of Dragith Nurn is a mask that can be assembled by connecting all five Mask Parts, which are dropped by monsters inside the dungeon. The following monsters inside this dungeon drop these pieces. 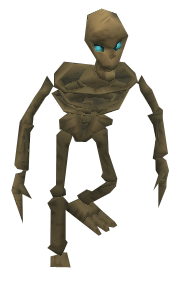 They have to be in the dungeon, other variants, like skeletons, will not work. With exception to the fifth piece of the mask, the parts do not drop instantly. It can sometimes take up to 20 kills to receive a piece of the mask as a drop. You can only obtain one part at a time, so you cannot keep on killing monsters for more parts if you already have one in your possession. 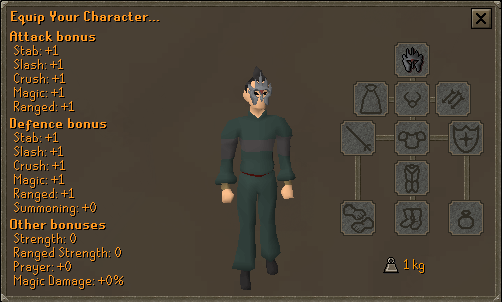 The monsters which drop each piece of the mask seem to be randomly selected. However, if you are struggling on getting a part after 40 or so kills, I suggest you move on to a different monster and keep trying for that part. Once you have collected all five parts, you can use any part on another and you will assemble the mask. You need to have all five parts in your inventory to do this; otherwise it will not work. Once you have assembled the mask, you cannot get any more mask parts to make multiple masks. If you happen to lose the mask you can return to the dungeon and hunt for more parts. These are the easiest monsters in the dungeon. They are great for training Magic at lower levels since they drop a bunch of runes, including mind runes. They also die fairly quickly. 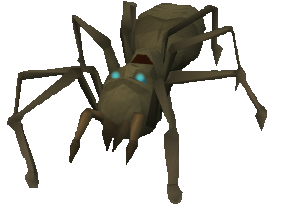 These creepy little things are also preferred for training as well, since they drop just as much runes as Warped Cockroaches, but they only have 35 life points. They drop runes as well, and they can also drop bunches of 15 Bronze Arrows. Along with dropping runes and up to 20 bronze arrows, they also drop leather and bronze armor. Drops runes and arrows along with bronze items. They also drop plenty of runes and arrows. Drops runes and bronze arrows, though not as often as previous monsters. These are preferred by low leveled meleers since they attack with ranged. 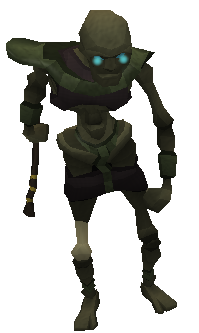 Make sure to wear ranged protective armor like a platebody and platelegs! 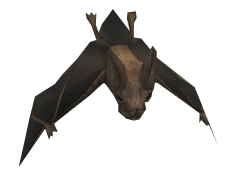 These have a chance on dropping an Amulet of Defence. Though they are rare, it can be a good profit for lower leveled players. As their name suggests, they attack with magic, so it is recommended to wear magic protective items like dragon-hide or leather. These can drop an Amulet of Magic. He can be summoned by touching the Diamond Statuette, or where it once was. He can be summoned infinitely but can only be fought once at a time. He uses all types of attacks (Melee, Magic, and Ranged), but he only attacks with melee if you get close to him. 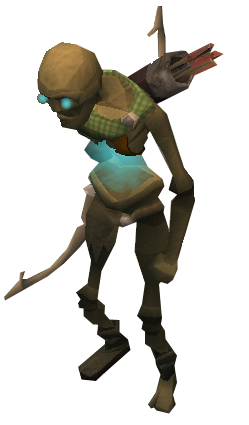 He can drop both the Amulet of Magic and the Amulet of Defence, along with a level 2 clue scroll if you are a member. He is often trained on by mid-leveled players.